I like Angry Birds as much as the next person, but it’s a little too, I don’t know … angry. Demolition Crush by Ganimedes Ltd.
Sure, those birds have valid beef with the egg-stealing pigs, and destroying their blocky structures is a lot of fun, but I don’t find any joy in it. Revenge is a rough business, and it takes its toll. Just ask the eponymous villain from Star Trek II: The Wrath of Khan. Oh, wait, you can’t — he’s dead. And also fictional, but whatever. 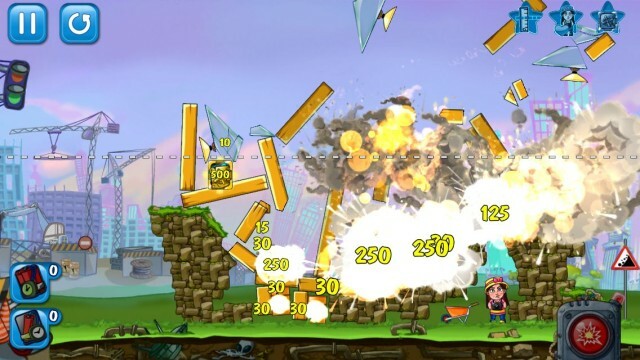 Demolition Crush, however, is a new free-to-play game that brings fun back to rampant and wanton destruction, and it’s worth your download. Here’s how it works: You’re given some structures and some bombs, and your main goal is to knock the buildings down below a certain line. Secondarily, you’ll want to destroy all the golden safes in the level and avoid harming the cute little girls who are inexplicably standing in the blast zone. Did you catch that? You’re actively trying not to hurt anyone. It’s crazy. It brings fun back to rampant and wanton destruction. Demolition Crush includes 180 levels to keep you busy for the foreseeable future, but some free-to-play shenanigans creep in to interfere with the fun. For starters, playing a new level requires you to spend “energy,” which is limited. 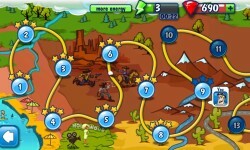 It refills over time (one per hour), or you can buy more with the rubies you earn from completing missions. Rubies, of course, are also limited, and you can get more via in-app purchases. The game also has an abundance of pop-up ads that you have to wait a few seconds to close. And maybe that sounds a little spoiled of me, but I enjoy playing the game so much that any hindrance is kind of a bummer. The Good: It’s a very fun destruction game that requires thought, planning, and precision. The Bad: Free-to-play staples delay and prevent you from playing it. The Verdict: Other than those quibbles, it’s a good time with an impressive amount of content.